Jönköping is situated in the north of Småland and, as well as Huskvarna, on the south coastline of Lake Vättern. Jönköping has 85,000 inhabitants although it certainly feels that there is more than that. Driving in the city was not as straightforward as driving in other Swedish cities – we got lost more than once. There is no doubt, though, that Jönköping is doing well. There are numerous new, modern buildings in the heart of the city. Outside the city centre, huge logistics centres have been developed, probably due to the proximity of the E4, Jönköping Airport and Gothenburg Landvetter Airport. Jönköping has a well-developed train and bus network (e.g. Bus4you Gothenburg – Jönköping – Stockholm). The central station, combining train and bus services (“Resecentrum”), is located in the heart of the city, close to Lake Vättern. Jönköping Airport is situated 15 minutes outside of the city. In summer, it is served directly from certain airports in other countries. Jönköping is Sweden’s fourth largest hotel city. The Elmia Exhibition Centre hosts a large number of fairs (amongst others, Scandinavia’s biggest caravan and camper show in September and the Elmia Wood forestry fair every fourth year in June), and draws in many visitors to the city. Each year, Jönköping counts over 3 million visitors. Hotels range from a simple Formule 1 to the Elite and Grand Hotels (see Hotels in Jönköping). There are around 200 shops in the vibrant yet cosy city centre of Jönköping. You’ll find another 80 shops under one roof at the A6 Center, a large business park and shopping mall. You can get there via the E4 taking exit number 97 on the motorway. Every Saturday morning there is a market at Västra Torget square, which is one of Sweden’s largest. There are swimming opportunities in the heart of the city, e.g. the 2 km long sandy beach on the shores of Lake Vättern, and a swimming spot at Rocksjön shoreline (whereby you will find the A6 Hotel and Hostel). Nature can be enjoyed all around the area. The Municipality of Jönköping has 28 nature reserves (amongst others, the 35 m high slopes of the sandbanks at Rosenlund – “Rosenlunds bankar” – in the northeast of Jönköping city centre) as well as 250 kilometres of hiking trails. The City Park, located on the hills west of the city, is more than 100 years old. 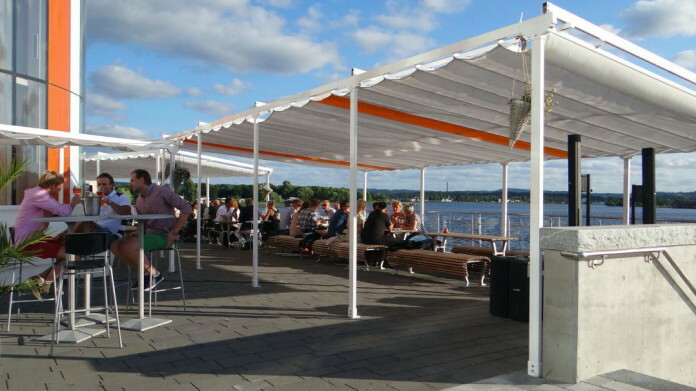 From here, you’ll get to enjoy stunning views over Lake Vättern, visit a bird museum, dine in one of the restaurants or have a go at miniature golf. Children will love visiting the little petting zoo (it’s got llamas too!) and Jönköping’s largest playground. The City Park is situated between the boroughs of Bäckalyckan, Mariebo and Skänkeberg. For long, mild summer evenings we recommend another park called “Strandparken”, located just along the shore of Lake Vättern. If you drive towards Elmia Exhibition Centre from the city centre, you’ll get to the Strandparken just before “Rosenlunds Rosarium”. There is also a restaurant close by the park. From the city centre, you can take boat trips on the Lake Vättern (M/S Nya Skärgården from 1915). They organise day trips as well as evening trips. However, the trips are not cheap as they are only offered in combination with a meal on board. The mountain of Taberg, located approximately 10 kilometres south of Jönköping, is well worth a visit. Not only does its peak rise 343 m above sea level, but Taberg is also 100 m higher than the surrounding mountains. 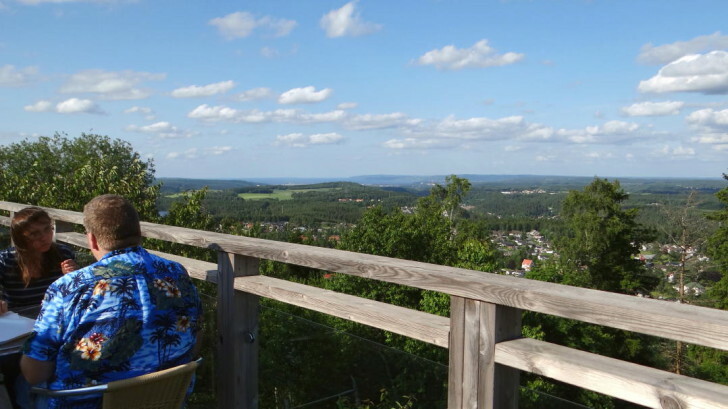 It offers breathtaking views across to Jönköping and Lake Vättern. Upon reaching the top of the mountain, you will find a cottage with a café and restaurant (Toppstugan). Carl von Linné called Taberg “the miracle of Småland”. If you are going by car, you can drive all the way to the top. Around 20 km northwest of Jönköping you will find Habo Church, a unique wooden church. Gränna is a picturesque but well frequented little town in the summer (candy canes!). As well as the two panoramic viewpoints, Gyllene Uttern and Brahehus, it is situated northeast of Jönköping and directly by Lake Vättern: Gränna by Lake Vättern.